In thirty years of (more or less) competitive cycling, I have never owned a more versatile bike than the Mason Bokeh. 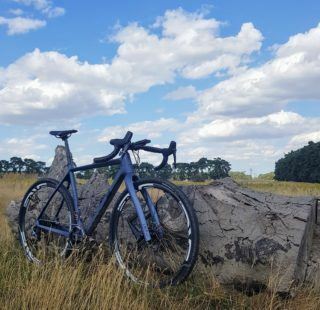 Friends from my old road club have dismissed it as a beefed up hybrid, and for others it deserves to be consigned to the “Jack of all trades” bin…a competent bike that excels at nothing. To be fair, I can see where they are coming from. I doubt it will ever win a time trial, it is unlikely to be competitive in a road race or a crit, likewise, it will be pretty rubbish at downhill! This is missing the point. 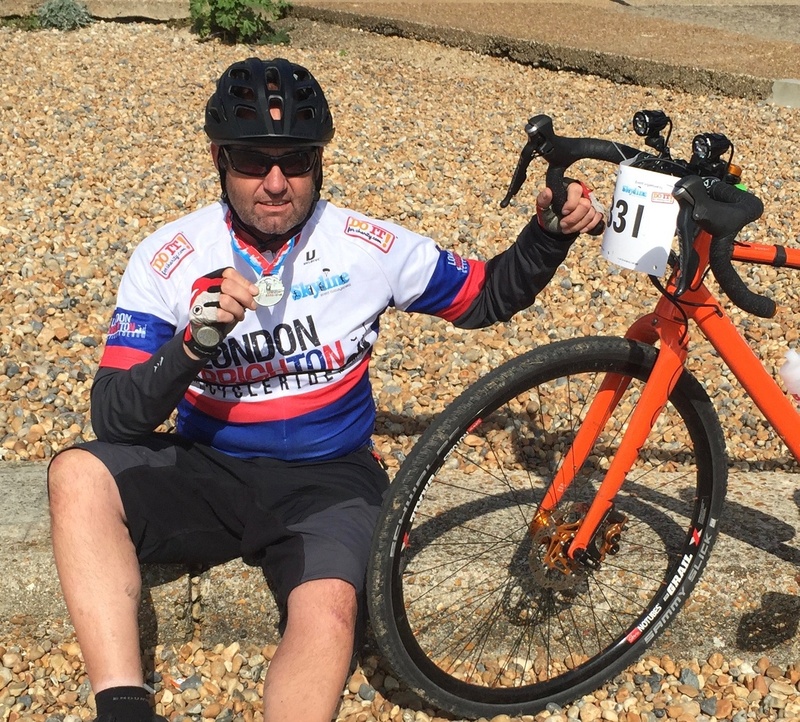 It has taken me a long time to accept this but, you don’t have to race to be a ‘real’ cyclist. You can avoid racing but still enjoy the thrill of going fast or even going quickly over long distances. If this is you, and you feel the need to add a healthy dash of ‘off road’ into your riding too, you will begin to approach the ‘raison d’être‘ of the Bokeh. There is an additional facet to this bike that I have yet to explore, and that is ‘bike packing’ or touring as us old folk used to call it. I’ll leave that to others until I retire. I built my Bokeh up in January 2017. It is a fairly utilitarian build, function triumphing over form. The drivetrain is a mixture of Shimano 105 and Ultegra, with the finishing kit mostly coming from my parts bin. 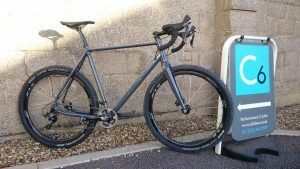 The wheels were specially built by Paul Kerslake at PT Cycles Stan’s Grails, Hope hubs and Sapim CX ray spokes. I keep toying with the idea of a proper upgrade but it all works so well together, I can’t see the point. At least not yet. 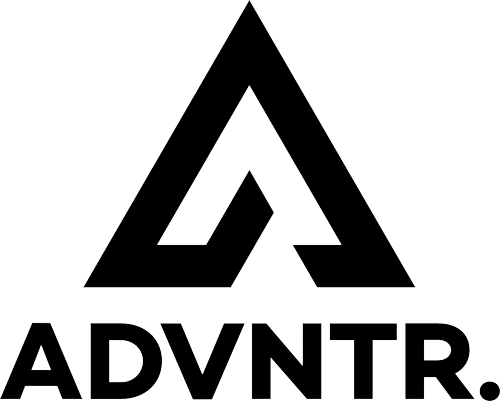 ADVNTR. 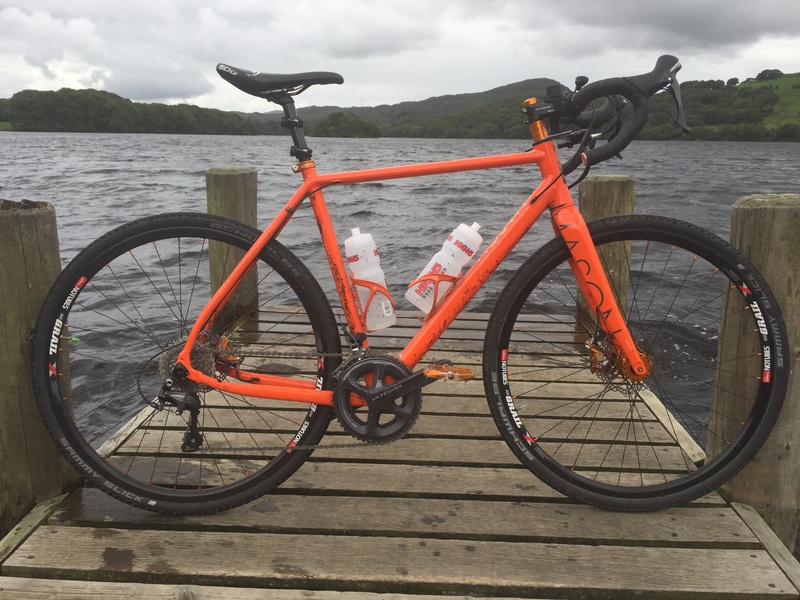 cohort James also couldn’t resist the temptation of the Bokeh and his Flare Orange model was built up with a similar mix of 105 and Ultegra components along with a set of Pacenti rims laced to Hope RS4 hubs. If you were to buy a Bokeh as a frame and fork only option, a rolling chassis or a complete bike, you would be immediately taken by the quality of the paintwork. James compares the quality to that seen in the automotive industry. After years of buying bikes where the paint is so fragile it falls off if you so much as look at it wrong, the finish just shouts quality. It isn’t invulnerable though, I have acquired scratches and chips on my frame but it took some effort. The next thing to grab you is going to be the build quality. The variety of tubes on display and the way they have been put together has to be seen to be believed. OK, you have to pay for the privilege as the Bokeh does not come cheap, but you are not going to better this for the money. 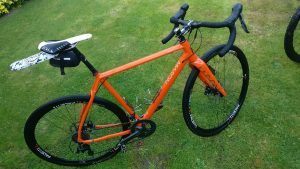 With versatility being a keyword, a question I am often asked is “what size wheels do you use?” This is difficult, as I have the option of 650b and 700c. For most of the riding I do, 700c is my first choice. In this iteration the bike spins along at a decent lick for mile after effortless mile, on or off road. There are times though, when 650b is appropriate. I think it is worthwhile spending a little time on the type of riding I do. To a large extent, this informs the wheel choice. Last weekend, James and I took our Bokehs out for a short audax, 117km of rural roads in East Suffolk. We thought we were in for a mixture on on and off road riding but we were wrong. The only off road was in the car park! 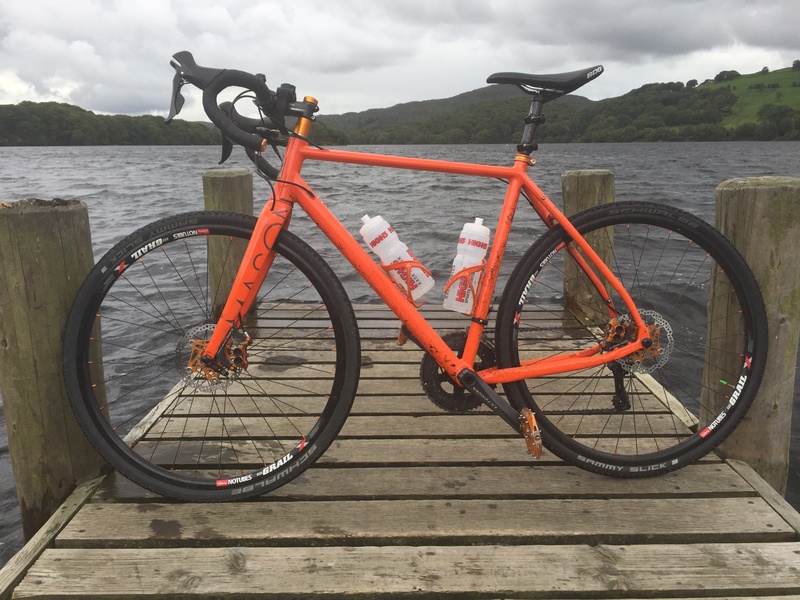 Despite having the wrong tyre choice (WTB Nano 40c), we averaged just under 18s. 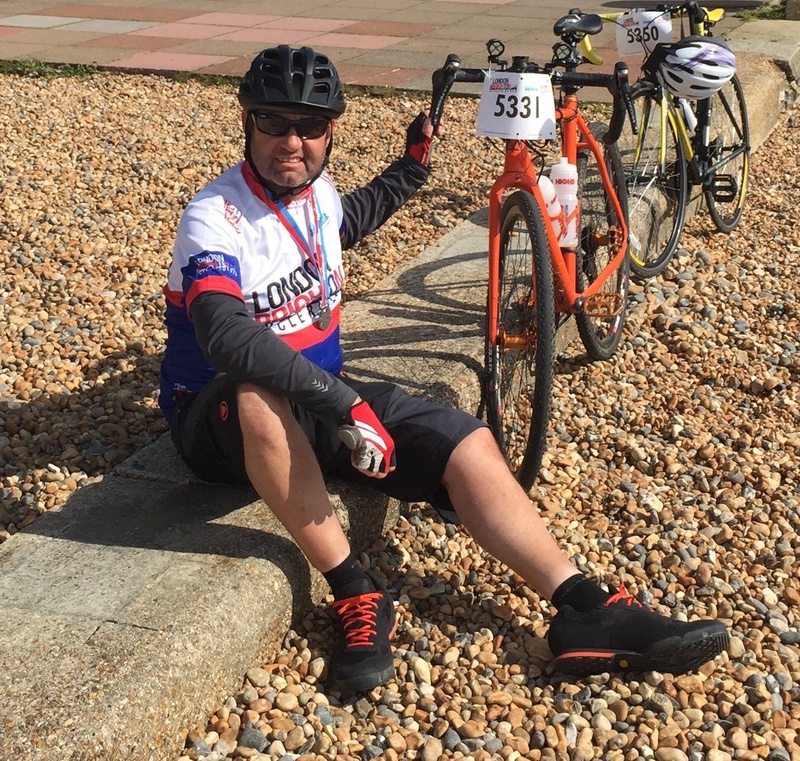 There was a surprising amount of climbing for Suffolk and then there was lost time dithering around the controls… but we were happy with the pace and despite taking it comparatively easy, we never felt slow. Evening rides (30-40 miles as a rule) are a mixture of wooded trails, roads, bridleways, singletrack and as many hills as I can find (hint – there aren’t many!) 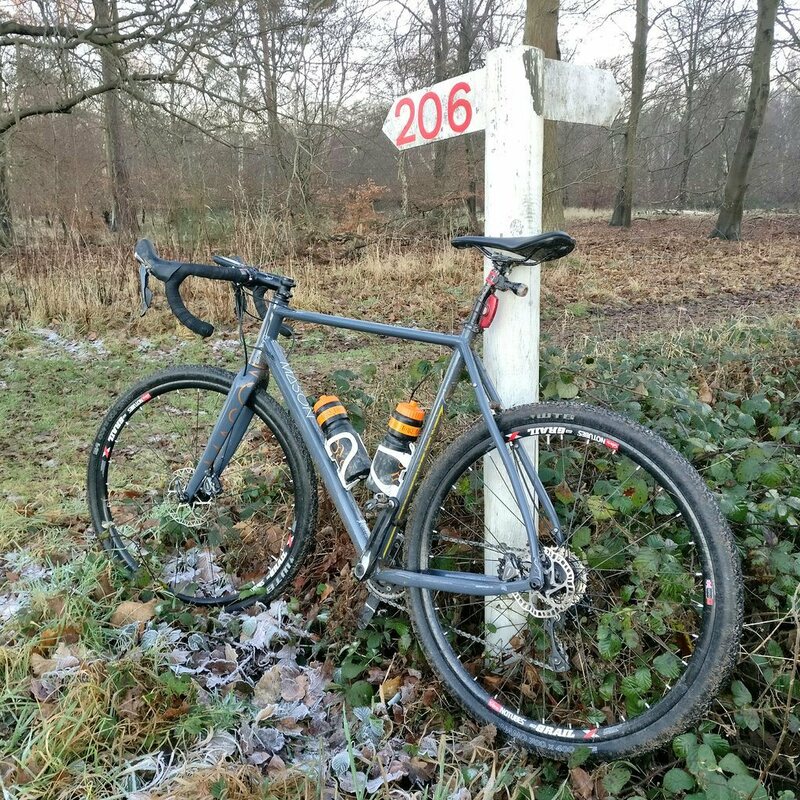 Occasionally we venture further afield and might take in 80 or 90 miles of mixed terrain. All of this is accomplished on 700c and Nanos. Earlier this at Yorkshire True Grit. 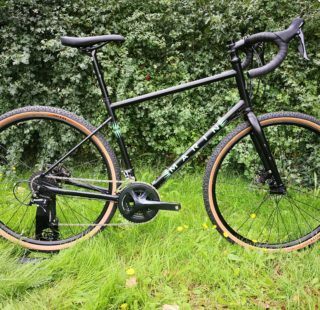 I could comfortably have ridden a hardtail over the more technical and rocky sections but Bokeh took the whole thing in its’ stride. The 650b wheels are hauled out of the shed when I know the ride is going to be bordering on natural MTB territory. For example, I used these wheels with Bontrager XR1 TLR Team Issue 2.1s for Yorkshire True Grit. 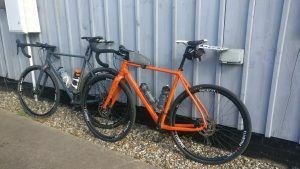 The tyres are fast rolling but with enough grip to see you round fast bends, and the extra volume provides a little more comfort over rocky trails than a 700x42c. The ride characteristics of the bike don’t really change though, whichever wheels you use. All those months ago when I had my first ride, my initial impression was how well mannered the bike was. There are no idiosyncrasies to learn, there no accommodations to be made. If you can imagine the bike version of an old pair of gloves, slippers or even your favourite jumper, well that’s the Bokeh. This isn’t a race bike but it gets up to speed quickly enough and is solid without being sluggish. 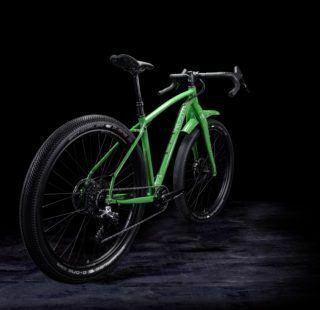 Sprint and the response is immediate, just don’t expect it to be like a carbon superbike. Over long distances the back end is surprisingly forgiving. Long off road rides (80 miles plus) are invariably completed with no backache. Not only that, I have little or no desire to stretch my back mid ride either which has to be a testament to the basic frame design. Talking about off road, you can ride singletrack. 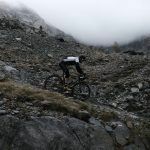 In fact, you can ride singletrack pretty quickly, sometimes too quickly. I have got myself into trouble more than once because I have underestimated my speed, so be careful! 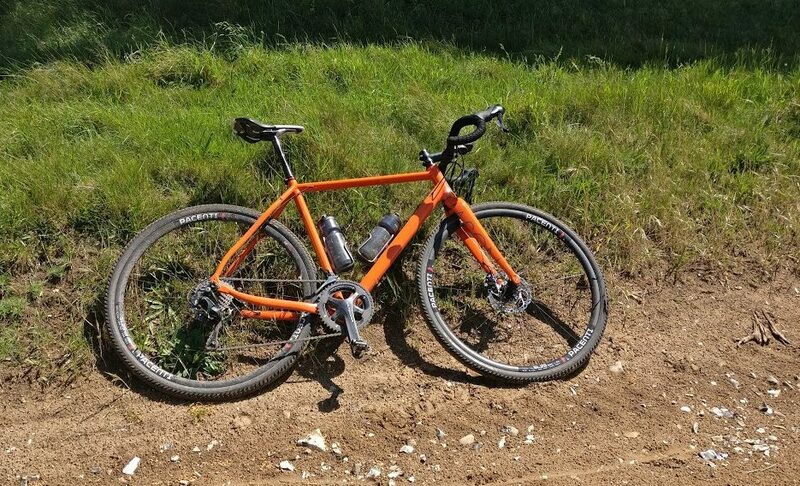 Incidentally, it is fun chasing mountain bikers out on the trails and seeing the look on their faces when you zoom by on what they take to be a road bike. However, the Bokeh is never going to wholly replace a mountain bike. You will know when you have asked too much of it. You aren’t thrown off, the bike just loses speed and you have to force it round tight bends, roots and so forth. Going down steep singletrack can be “interesting” too. For me, this is almost the ideal bike. The only way to cover all the bases would be to have a Mason Definition or a Resolution in the shed too but if not, the Bokeh is going to be almost all the bike you need. 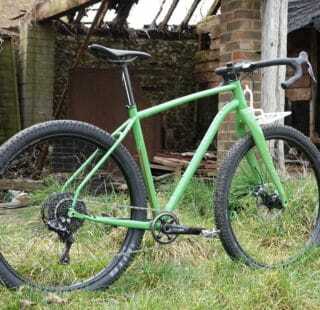 I want to explore the bike in 1×11 mode and also with a dropper post. These are slated for the future. 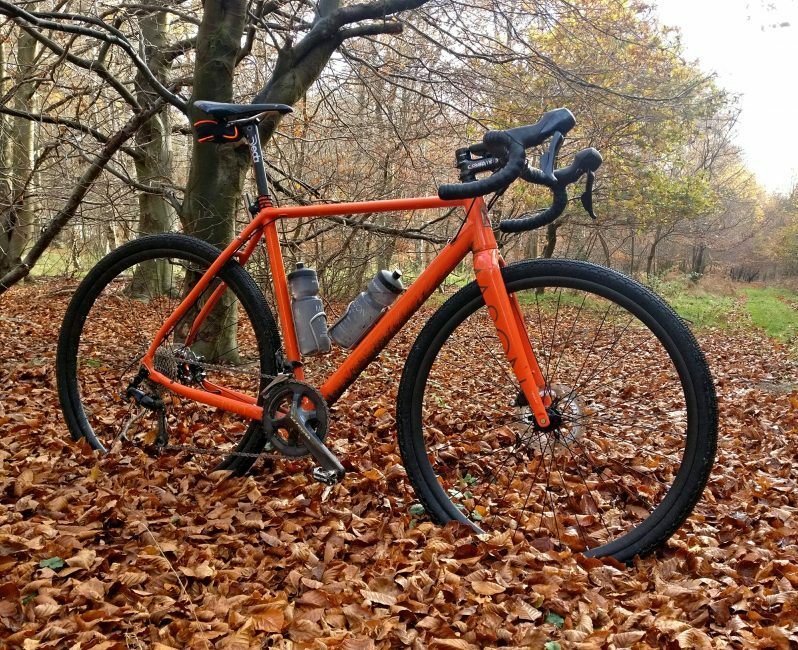 £1,150 is a lot of money to spend on an aluminium frame and fork. It is fair to say that all aluminium frames are not created equal. The Bokeh slips in at the sublime end of the spectrum. If this bike is on your wish list then don’t hesitate. I doubt you will regret it. If you can accept what this bike is, and what it is for, then you are in for a real treat. Am I a bit of a fanboy? Probably, but there again, I am struggling to see a future for most of the bikes in my shed. Apart from long/fast road rides , my road bike gets little use. My mountain bikes get even less! Verdict: If you’ve even briefly considered a Bokeh, just stop tormenting yourself and get one! If you’ve even briefly considered a Bokeh, just stop tormenting yourself and get one! Nice build! Must have some serious stopping power with those Hope’s too. I just love how adaptable these bikes are for whatever you want to do with them. Enjoy the ride! Just ordered a frameset. I plan to build it up with a 1×11 drivetrain with Ultegra Di2 hydraulic shifters and an Shimano XT Di2 rear mech. 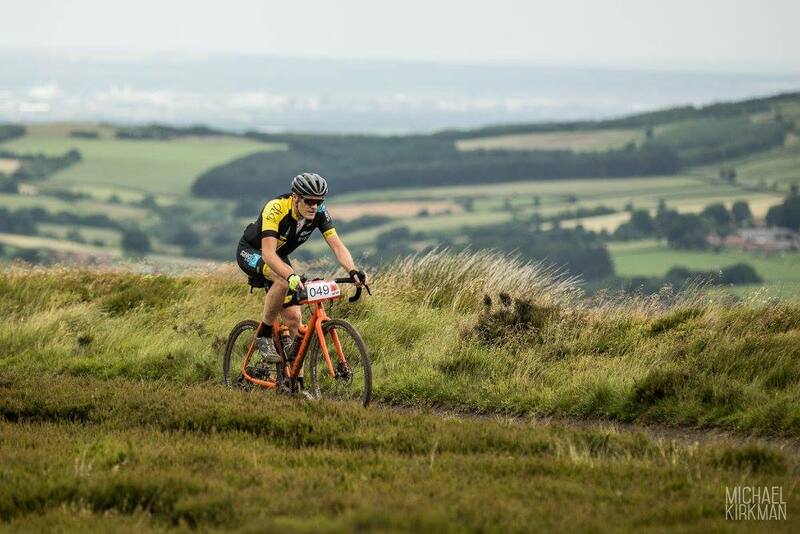 Roll on the Dirty Reiver! That’s a really great setup. 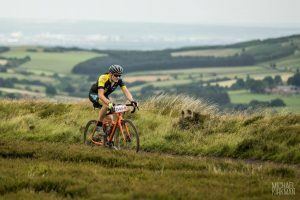 Perfect for the Dirty Reiver too – see you there!